England took control of the third Test with eight wickets in the final session of day two as Sri Lanka tamely collapsed in Colombo. The hosts had reached 173-1 in reply to England’s 336 but lost nine wickets for 67 runs to be dismissed for 240. Adil Rashid finished with Test-best figures of 5-49, Ben Stokes claimed 3-30 and Keaton Jennings took four fine catches at short leg. England closed on 3-0, leading by 99 runs. Dimuth Karunaratne hit 83 and Dhananjaya de Silva made 73 in a stand of 142 to put Sri Lanka on top approaching the tea interval. But Dhananjaya’s dismissal gave England an opening and they ruthlessly ran through the rest of the order to take a step closer to winning every Test in a series in Sri Lanka for the first time. The tourists have an unassailable 2-0 lead in the three-match series. Rashid bowled just one over before lunch and returned to the attack with Sri Lanka coasting on 148-1 to begin a wonderful, match-turning spell of 5-43 in 12.5 overs. His first wicket was a somewhat innocuous delivery that Dhananjaya tried to push away square, only to pick out Jennings at short leg. But, especially after tea, Rashid then bowled with real verve, finding a heady mix of dip, turn and bounce to force Sri Lanka’s batsmen into playing him tentatively and bringing the close fielders into play. The leg-spinner got one to lift at Karunaratne, who edged it into his pad which sent the ball looping up to give Jennings the easiest of catches, before a brilliant googly deceived Roshen Silva into an inside edge that Jennings grabbed one-handed with aplomb. He then had Kusal Mendis prodding a late cut to Stokes at first slip before finishing off Sri Lanka’s tail by removing last man Malinda Pushpakumara lbw for 13. Stokes provided excellent support from the other end, extracting pace and bounce from the best batting pitch of the series and baffling the batsmen by varying his length. All three of his wickets were caught behind. Foakes took a superb low effort after initially moving the wrong way when Angelo Mathews miscued a pull shot off the toe end, before Niroshan Dickwella glanced one down leg and Dilruwan Perera fended loosely at a ball angled across him. Sri Lanka had made an assured start to their innings when Jennings made the first of his four vital interventions. He showed tremendous anticipation at short leg to move in sync with the advancing Danushka Gunathilaka, ensuring he was there to gather once the opener edged a slog off his pad and into Jennings’ stomach. 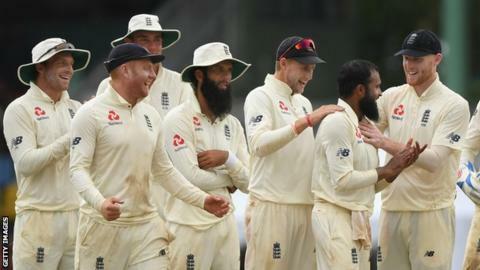 England were still flat in the field as Karunaratne and Dhananjaya accumulated with ease and nullified the threat of Jack Leach and Moeen Ali, with Joe Root dropping the batsmen on two and 42 respectively, each time at first slip off the bowling of the unlucky Stuart Broad. But Jennings, who took a sublime one-handed catch and combined with Foakes for another in the second Test, had only just started. He stayed low and still to make a tough take off the full face of Dhananjaya’s bat look easy, before rising up quickly to grab Karunaratne’s edge in front of his face. It is tough to call which of Jennings’ takes was the most impressive – his first catch showed shrewd anticipation and his fourth displayed remarkable reactions, holding on one-handed low to his left to remove Roshen. England are perhaps fortunate that events conspired to return Jennings to short leg – Rory Burns started the series there before taking a blow to the back of the head in the first Test – but he has made the position his own now, albeit dependent on his form with the bat.